A risk is a measure of uncertainty. Relative risk reduction talks about an event is the likelihood of the happening after the exposure to a risk variable when compared in the light of happening of the occurrence of the same event in a controlled or a reference group. The definition of risk reduction can alternatively be defined as the difference in the occurrence of an event when compared between two set of groups which is expressed in contrast as the proportion of an untreated group. The set of groups taken in relative risk reduction often remains constant across the given set of a population with a different underlying set of risk. The concept of relative risk reduction is more accurate and expressive when compared in the concept of absolute risk. Also the lower the event rate in the control group, the larger the difference between relative risk reduction and absolute risk reduction. When the event has a relative risk reduction of greater than 1, the risk of the outcome is then stated as an increase by the treatment. On the other hand, when the risk of treatment is lower than 1 then the risk of a bad outcome has been decreased meaning that the treatment which was conducted had a positive impact on the experimental group of people and individuals. 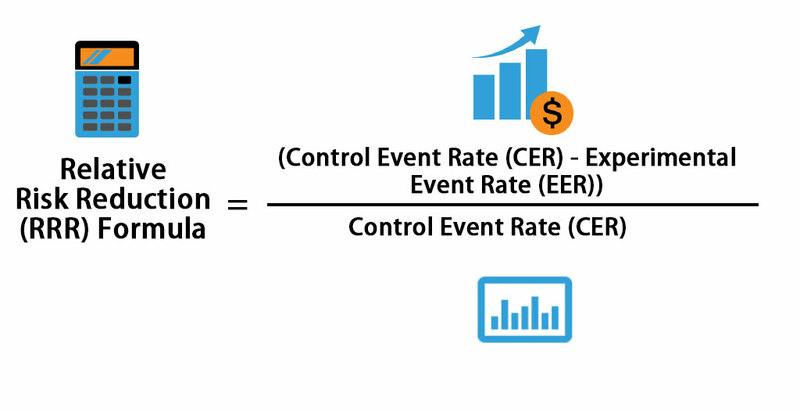 A Relative Risk Reduction of 1 means that the risk of the event is identical in the exposed and the control samples. Let’s take an example to understand the calculation of Relative Risk Reduction formula in a better manner. FIC institute of medical research conducted an experiment for Control Event Rate Compared Treatment to a new Chemo drug which was recently launched. 70% of the control group died and 35% of the experimental group died. Calculate the Relative Risk Reduction for the new chemo drug introduced. Medical Institute of the United States of America conducted an experiment for Neuropathy. The experiment states that if 20% of the people die with the treatment of Neuropathy. And 15% die with treatment Control Event Rate then calculate the relative risk reduction. The risk of treatment is lower than 1 then the risk of a bad outcome has been decreased. Hence the treatment of Neuropathy had a positive effect on the healing of the individuals. According to the DDT Data of the United Kingdom, 60% of the controlled group died of Chemotherapy and 30% of the treated group died of the same. Calculate and interpret the Relative Risk Reduction of the above problem. It means that it has a positive effect on the experimental group. Risk measures have the advantage of being stable across populations with different baseline risks and are, for instance, useful when combining the results of different trials in a meta-analysis. Relative Risk Reduction is widely used in the medical industry to calculate the effect of the introduction of new medicines and medical practices also which in turn results in the betterment and the improvement of the medical industry in general.